Save an additional $900 to $1,000 per couple off this cruise. This offer is combinable with most promotions. Expires April 30. Click here for eligible departures. Save $1,520 to $8,370 per couple off this cruise. Click here for eligible departures. For a city whose history can be traced to the 7th and 8th centuries,Düsseldorf's contemporary architecture, edgy art culture and innovative business landscape is all the more impressive. The capital city of the North Rhine-Westphalia is decidedly posh, pushing the boundaries of high fashion and high-rise design, and a culinary and nightlife scene that caters to the international elite who populate the city. Indeed, banking and cutting-edge technology industries have brought the city great wealth, while its flair for the creative and collective passion for celebrations of all kinds take some of that serious edge off the atmosphere, making Dusseldorf one of the world’s most livable cities. In the Altstadt, the historical quarter along the Rhine, look for an intriguing blend of time-honored sites and traditions and a lively modern neighborhood filled with energetic bars and restaurants. This little town in the heart of the Mosel Valley is one of the best preserved medieval locales in the region. Bernkastel’s colorful Market Square is considered among the most authentic and lovely of those that line the riverside, with a Renaissance-era Town Hall overlooking the bustling activity of shops and cafes. Don’t miss – not that you could – the towering Spitzhäuschen, or “pointed house” that famously rises above the other rooftops in Bernkastel. With its ground floors built narrower than the upper floors, the building appears to wobble off balance, but has stood strong since it was built in 1416. Visitors to Trier may feel the need to double check their GPS to ensure they didn’t take a wrong turn near Rome. Fair enough, since the town that sits on the border of Luxembourg was founded by Romans, and still bears remarkably preserved evidence of the culture. Known as “Second Rome” for its remaining Roman baths, amphitheater and imposing Porta Nigra gateway, Trier is among the oldest cities in the world, celebrating its 2,000th anniversary in 1984. It has since become synonymous with the rolling wine vineyards of the Rhineland that follow the Moselle, with the 12th century Eltz Castle watching over the town. A 2,000-year history has given Bonn many opportunities to reinvent itself and its role on the global stage, and it has done just that. Founded by Romans, like its nearly neighbor, Trier, Bonn was the onetime capital of the Electorate of Cologne, the site of the largest known Roman fortress, and, more recently, the capital of West Germany from 1949 to 1990, when reunification moved the government to Berlin. Bonn is still considered the unofficial second capital of the country, and is home to several governmental operations, as well as more than 20 United Nations institutions. Even throughout its centuries of political and powerful prominence, Bonn’s most famous son remains composer Ludwig Von Beethoven, who is commemorated in a museum at the site of his birth home in the city. 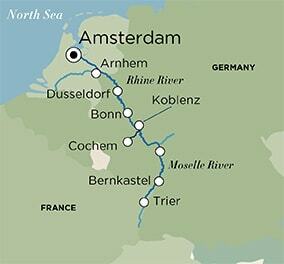 Experience a journey along the river less traveled and the fairytale sites of Germany and the Netherlands. Venture to meccas of music and art in Bonn, the hometown of Beethoven, and Dusseldorf, a hub for contemporary fashion and architecture. Explore the famed Mosel Wine Region that embraces the Moselle River, and trace the path of history along cobbled alleyways and charming town squares.